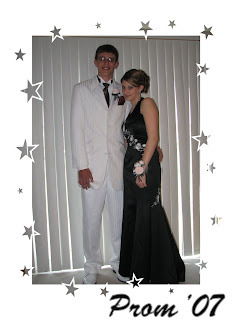 Beth went to prom last night with her friend Ryan. She's a sophomore. He's a junior. They looked very nice! We, of course, had to take pictures when he came to pick her up. The hard part was finding a good place to take them. Beth got up early in the morning to go over to her friend Cristina's so Cristina could do her hair. She came home with it all curled and put up. Very nice. She then had the rest of the day to keep it looking good and not lean on it. Ryan picked her up around 3:30, we took the pictures, and then they went to his house so his mom could take pictures. Then they went to meet the other couple they were going with, and his mom took pictures too. Between all of them, they should have some pictures to remember the evening by. Beth also took a camera with her, but I have yet to see what kind of pictures she took. They all went out to dinner and then went to prom. The dance was from 7 - 11. Afterwards, Ryan brought Beth home, and they got here around midnight. They were going to go to the after-prom party, but Ryan had to be home right after prom because of his grades. Progress reports just came out last week. It sounded like they had fun, and Beth was pretty tired. She did look pretty, didn't she? We were shopping a few weeks ago, and Cory saw some shoes he thought he'd like - green shoes. We were busy shopping for a prom dress for Beth and all the stuff that goes with that, and we were in a rush. We found Beth a dress at the first mall we went to, so we bought it there, but, she wanted to check a store at another mall. We really didn't have a lot of time there, so we didn't have time to look at other stuff. We did have time to quickly check out Steve & Barry's, which is where Cory saw the shoes - just not time enough to try them on and decide for sure these were the ones he wants. Then today, we saw these shoes on Oprah, so I decided to look them up. There are all kinds of Starbury shoes available, so he's not really sure which ones he wants. Maybe these green ones. Maybe another style or color. I am all for buying him $14.98 shoes - especially since his feet are probably still growing, and these shoes are supposed to be just as good as the $100 shoes other people are selling. No way no how would I ever pay $100 for a pair of shoes. unless, of course, there was no other choice As long as Starbury shoes are available, I won't have to! Last week Beth put more miles on the van than should have been, if she had only gone where she said she'd gone. When we asked her about it, she said she had gone to her friend's house after the softball game and then taken a wrong turn and gotten lost. So, instead of 15 miles, she put 60 miles on the van. I also noticed some scratches on the back of the van. When we asked her about that, she said she backed into a mailbox. Why didn't she mention either of these things when she got home that night? She didn't seem to see any need to tell us about getting lost and driving miles out of her way. She didn't want to tell us about the scratches because we would 'freak out' and she might lost her driving privileges. So, we went over how she is supposed to tell us about things. It is worse to try and hide things than just be honest about it. If she wants us to trust her, she needs to show she is trustworthy. Honestly, I don't think she gets this. Today I went online to transfer some money into her checking account - only to find that she has been spending money at McDonald's and Walmart. Fine. It's her money. She can spend it on whatever she wants to spend it on. However, on both of the days she spent this money, she told us she was at a friend's house. On one occasion she even said her friend's mom had been out shopping and brought the t-shirt home for her friend. Her friend didn't want it, so she gave it to Beth. And the mom brought home food from McDonald's too. This is something that this mom would do, so I didn't question it - until this morning. In the mail today I found out that Cory's class is ordering their class rings next week. Then, when he got home from school, he had a whole packet of information - catalog, price list, all that stuff. When Beth came home with the same stuff last year, we decided not to order her a ring. Her dad said he would buy her one if she really wanted, but she is always sure to let us know how much she hates school, and she's not involved in anything at school. So there really wasn't anything to put on a class ring. Why pay that much for something that she's really not going to appreciate anyway? She thinks she might want a ring or a necklace or some other piece of jewelry instead, but so far she hasn't found the exact right thing. Cory, on the other hand, likes school and wants a class ring. So he sat down at the computer tonight and designed his ring. It's going to be really nice. If they order next week, they're supposed to be able to save $50 - $20 off at the time and then a $30 rebate - so that's good. Also, by designing his ring online and printing out his order, he's supposed to get a free ring with his graduation year on it. I guess they get those right away. I never had a class ring. My mom let me wear hers, and it really didn't bother me not to have one, but I'm glad Cory gets one. Jeffrey's grandma paid for his, so he got one. Then one day he gave it to me and said he never wanted it back. So I still have it! It wouldn't fit him now anyway, though I suppose he could get it resized if he wanted to. No, I didn't write poetry. I didn't even read it. I got a call this morning, shortly after the kids left for the bus stop. It was Beth. She forgot her homework downstairs on the printer. Could I please bring it to her? She did her homework. She printed it out. She just forgot to go downstairs and get it so she could take it to school with her. Lucky for her, she realized this by the time she got to the bus stop. Someone had a phone she could use, and the bus wasn't going to be there for another 5 minutes. So I went downstairs, grabbed the pages off the printer, jumped in the van, and took them to her. I told her she owes me now. She will be baking those cookies I asked her to bake. I asked her to bake them yesterday, but she didn't want to. Ok, I was going to bake them and just be sure she didn't get to eat any of them. Now I expect her to bake them. She really needs to learn that, if she expects other people to do things for her, she needs to be willing to do things when she's asked. She can't just expect us to do everything for her while she gets to sit around with no responsibilities. But for some reason she seems to think that's the way things are supposed to work. Must've done something wrong somewhere along the line. Well, we have 3 kids and at the time of this story they were 4 years old, 3 years old and 1 year old. The middle one is Eli. Eli really loves Chapstick. LOVES IT. He kept asking to use my Chapstick and then losing it. So finally one day I showed him where in the bathroom I keep my Chapstick and how he could use it whenever he wanted to but he needed to put it right back in the drawer when he was done. We finally have the older one and the baby loaded in the car and I am looking for Eli. I have searched everywhere and I finally round the corner to go into the bathroom. And there was Eli. He was applying my Chapstick very carefully to Jack's . . . rear end. Eli looked right into my eyes and said "chapped." Now if you have a cat, you know that he is right--their little butts do look pretty chapped. And, frankly, Jack didn't seem to mind. And the only question to really ask at that point was whether it was the FIRST time Eli had done that to the cat's behind or the hundredth. Yesterday Beth wanted to go to the girls softball game at the park across from the school. To the school and back, round trip, it's 14.1 miles, or so Yahoo Maps says. I put gas in the van yesterday morning, so I reset the trip odometer to 0. At most when I got home there would have been 5 miles on it. So, if 5 plus 14.1 equals 19.1, why does my trip odometer have almost 65 miles on it? Something tells me she went somewhere besides the softball game. She just recently got ungrounded for going somewhere she wasn't supposed to go and telling us she was somewhere else. I guess the girl just doesn't learn - or we're not taking the right things away or for long enough. We found out yesterday that Driver's Ed. and Advanced Language Arts 10 are both going to be at the same time next year. That means that if Cory wants to take Driver's Ed. (the classroom portion), he will have to take it this summer during summer school. Either that or we will need to sign him up for a private driving school. Since summer school isn't going to cost us anything, except probably transportation back and forth to school for six weeks, summer school seems to be the best choice. He could have bus transportation to school for the first four weeks, but he would have to choose another summer school class, and he isn't interested in any of them. We thought maybe he could help the band teacher out, but her classes are all going to be held in Eagle at the Elementary school. So that won't work. Either way we would have to provide transportation the last 2 weeks of class. This basically takes his whole summer. Summer school starts about a week after school lets out and goes through the end of July. Yes, it isn't all day every day, but he will still have to get up and get going in the mornings. I guess it's good that he won't be able to sleep his summer away. I'm not really looking forward to going back and forth to Palmyra a couple of times every day, but Beth should be able to help with that since she can drive now. With the cost of gas, it will end up costing at least a couple dollars every day, but that really is cheap compared to the cost of a driving school. Hopefully next summer when he takes the driving portion of the class it will still be free - like it was for Beth last year. Driver's Ed. is seriously a good deal in this district. We really should be thankful for that. Cory was figuring this would be his last summer to spend some time with his grandparents in Kentucky, but now he won't get to do that. We'll have to tell the grandparents. Perhaps they can come visit us for a while. Then we could all spend some time with them. I have recently found out that it is possible to get paid for blogging. While I started my blogs to keep track of my life, and, if some other people want to read along, that's great, I really like the idea of getting paid. A new website that connects bloggers and advertisers is now live, and they are looking for bloggers. If you are interested in being paid for blogging, head on over to Bloggerwave and sign up. There are some opportunities just waiting to be written about in your blog, like this one I have just written in mine. Look how easy it is. When I look at a patch of dandelions, I see a bunch of weeds that are going to take over my yard. My kids see flowers for Mom and blowing white fluff you can wish on. My kids sit in it. They see dams to build, rivers to cross, and worms to play with. Cory was up early this morning. He jumped straight into the shower, and emerged a while later dressed and ready to go - wearing his jeans and his Spider-man t-shirt. Yes, the perfect way to get a teenage boy out of bed before noon on a weekend is to have tickets for the new Spider-man movie. It's a big movie month - big movies are coming out, and Spider-man 3 is the first of them. The new Marcus Majestic Theater opened Thursday night just in time for the midnight release of Spider-man 3. It's a good thing it did, too, because otherwise there would have been no UltraScreen to watch the movie on. That would have been a shame! That movie belongs on the UltraScreen - all that action just begs to be HUGE! The new movie theater offers Reserved Seats - so we tried that. Usually, when we want to see a new movie on the UltraScreen, we have to show up an hour early and wait in line, just to be sure we get good seats. While I think that is part of the experience, it was also nice being able to walk right in and have seats waiting for us - prime seats, too. They were front-row in the balcony area - at the perfect level so we didn't have to look up or down, but had a perfect view of the screen and all the action. The Reserved Seats do cost a little extra, so I'm not so sure that is something we will always do, but it was nice to try. I suppose it will depend on the movie. You know when Pirates comes out, we'll want the best seats possible. The movie was very enjoyable. It started immediately, with no previews. I really like the way the Spider-man movies bring you up to date on what has already happened in the opening credits. Lots of times when we are going to see a movie sequel, we watch the previous movies first just to reacquaint ourselves with the story, but we didn't do that this time. We just ran out of time. So it was good to have the quick review in the opening of the movie. Spider-man 3 has it all - heroes, villains, action, a love story, friendship, and forgiveness. There is plenty of excitement to keep you on the edge of your seat, and a good story to tie it all together. See it. You'll like it. Beth is planning to get a job soon, so having a checking account will be good. Once she finds that job, she can sign up for Direct Deposit so she can get her paychecks put right into her account. That way she won't have to worry about picking up her checks or getting to the bank to cash them. Even if she doesn't do the Direct Deposit thing, she will at least be able to cash paychecks without needing one of us and our account. Besides that, it will make it easier to give her money if we don't happen to have cash on hand. That doesn't mean she just gets money any time she want some - whatever she may believe. It will be good for her to learn to keep track of the money in her account - something she needs to know how to do. Also this week I got her a Discover card - this one for putting gas in the car only. I think she'll do ok with that. She is very adamant about not using credit cards - ever. Good for her. I hope she sticks to that. Getting into credit card debt is a very bad thing. The Discover card? Just convenience, so we don't have to be sure she has the cash with her, and we get a 5% cashback bonus on gas purchases. I always pay that off every month.